First things first: for the many people who have been asking, we will soon be putting up Flash Reviews for the new Moment Commander 98 and Commander 108. Those should go live within the next week. But before we do that, we wanted to post our measured specs, rocker pics, and initial impressions for the Commander 98, to give you an idea of why it stands out so much. The Commander 98 shares a very similar shape and rocker profile with the Commander 108, so I’m not going to go quite as full-on gear nerd here as I did in our First Look of the Commander 108. The long story short is that both of the Commanders have a pretty significant amount of tip and tail taper, pretty deep tail rocker lines, and pretty low tip splay. The Commander 98 has significantly more tip and tail taper than most skis in its class apart from a few skis like the Dynastar Legend X96 and the DPS Alchemist Wailer 99. In terms of rocker, the Commander 98 has deeper tip and tail rocker lines than most skis that are around 98 mm underfoot, though the ON3P Wrenegade 96 has similarly deep rocker lines and way more tip splay. This is a very strong flex pattern that is quite stiff through most of the ski, but smoothly transitions to slightly softer sections in the last ~20 cm of the tips and tails. Jonathan Ellsworth noted that the Commander 108’s flex pattern was nice and round, and the same can be said of the 98 — its tips aren’t wildly softer or stiffer than its tails. Compared to the Commander 108, the Commander 98 is ever so slightly stiffer at the extremities, but the difference is pretty minimal. The Commander 98 has stiffer tips and shovels than the Blizzard Bonafide, and a similarly strong tail. Compared to the (quite stiff) Dynastar Legend X96 and Atomic Vantage 97 Ti, the Commander 98 is a touch softer, particularly in the tail. This is probably the most surprising thing about the Commander 98 and 108 — they are very light for skis that have two layers of titanal. Of the skis on our list below, the next lightest ski that also has two full layers of titanal is the 4FRNT MSP 99, which is nearly 200 grams heavier per ski. And just to illustrate the changes in industry trends over the years, we also included the weight of Moment’s old 104mm-underfoot touring ski, the Tallac. The backcountry-specific 186 cm Tallac is a bit heavier than the inbounds-oriented 178 cm Commander 98. It’s pretty interesting to go back and read Jonathan’s review of the Tallac and hear him talk about how light it is at ~1800 grams, while today, there are several inbounds skis that are lighter than it. For reference, below are a few of our measured weights (per ski, in grams) for a few notable skis. As always, note the length differences to keep things apples to apples. Personally, I’m very excited about the Commander 98 and 108, and I really don’t know what to expect. But here are a few of the particular things we’ll have in mind during our testing. (1) Is the Commander 98 more of a nimble all-mountain ski, or more of a big-turn, fall-line charger? (2) How will the Commander 98’s significant taper and fairly deep rocker lines perform on very firm snow? (3) Given its weight, how suitable is the Commander 98 as a 50/50 or touring ski? (4) How does the ski feel and perform with the bindings a few cm forward of the recommended line? (5) How demanding vs. forgiving is the Commander 98? (6) Of the big, important class of ~98 mm wide skis, where does the Commander 98 fit in, and which skis feel most comparable? Just like the Moment Commander 108, the Commander 98 is a pretty unusual ski that certainly stands out. We will post Flash Reviews of the Commander 98 and 108 as soon as possible, so stay tuned for updates. Blister members can now read our initial on-snow impressions in our Flash Review of the Commander 98. When we first got the new Moment Commander 98, we weren’t really sure what to expect. As you can see in our First Look, we had a lot of questions, and didn’t have a good sense of where the ski would slot in the ~100 mm all-mountain category. But I now have 10 days on the 178 cm Commander 98, and Jonathan Ellsworth and Sam Shaheen have also put time on it and this is a ski that we’ve discussed it a lot — including on our latest GEAR:30 podcast. 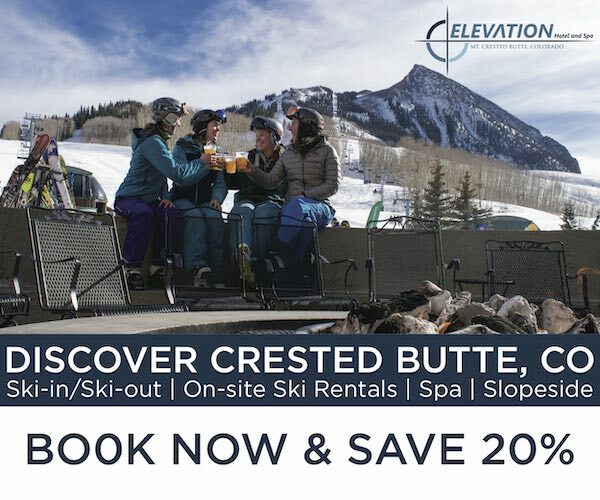 Luke Koppa on the Moment Commander 98, Crested Butte Mountain Resort, CO. While I think the Commander 98 does quite well off piste, I was very surprised by how much I liked it on groomers. On anything softer than straight ice, the ski held an edge surprisingly well (given its rocker lines and taper). But more importantly, I could really lay into the Commander 98’s stiff flex pattern and was then rewarded with a lot of pop coming out of a turn. On fairly smooth, soft-ish groomers, I had a great time while cranking out both fairly tight, and pretty big turns at high edge angles. And the Commander 98 was not only versatile in terms of turn shapes, but also stances. If I wanted to, I could lay off the shovels and ski from a pretty neutral stance. But when I wanted to really drive and push the ski, I could get over the shovels as much as I wanted, even though we skied it in a length that we all worried would feel a bit short (I’m 5’8”, 155 lbs). The Commander 98 didn’t pull me into a turn like a narrower, carving-oriented ski. But the Commander 98 does initiate turns intuitively, which, for a ski that I’m going to use off-piste a lot, is what I’d prefer. Moment talks about how the Commanders can handle both straightlines and tight terrain, and I think that’s pretty accurate. The Commander 98 held a strong edge during big turns on corduroy, but it was also very easy to feather and throw the ski sideways to shut down speed. The only time when I felt like I needed to slow things down on the Commander 98 on groomers was when the snow had been cut up at the very end of the day and there were lots of pushed-around piles of snow. Here, the ski would get knocked off track if I wasn’t paying attention and anticipating the patches of snow. But if the snow was smooth, I could basically ski it as fast as I wanted. All in all, I really like the Commander 98 on groomers. I’d prefer a narrower ski with less rocker and taper (e.g., Head Monster 83 Ti) for really smooth, firm snow / ice. But on anything softer than ice, the Commander 98 is a blast. When I was attentive and making deliberate line choices, I really liked the Commander 98 in bumps. It has a really low swing weight and it’s pretty easy to slide through troughs, which made it feel very nimble. And since it’s pretty stiff, I could drive the front of the ski quite hard. When I got lazy, the Commander 98’s stiff tails urged me to be better — this is not a great ski for people who tend to get backseat a lot in bumps. That said, the Commander 98 wasn’t as punishing as I expected; I found its fairly round flex pattern to be pretty intuitive in bumps. It will punish backseat skiing, but I think its sweet spot is pretty big (as do Sam and Jonathan). I haven’t personally had any issues with the Commander 98’s tips in bumps. They’re low, but they haven’t caught on anything while I was skiing moguls. Jonathan has had an issue with the Commander 108’s similarly low tips in bumps, but he skis with a more forward stance than I do. So from my experience, if you’re not deliberately driving the tips of your skis really hard down into the troughs of moguls, the Commander 98 seems to do just fine. In fairly shallow (<6”), soft chop, I was still able to ski very hard and fast on the Commander 98. Its stiff flex pattern meant I could drive the ski through the soft chop and keep moving downhill. When that soft chop had been sitting in the sun for a few days — thawing, refreezing, and turning into crud — the Commander 98’s low weight began to make itself known. This is not what I’d call a “plush” ski. I think it is quite damp for its weight, but it still felt a bit jarring when skiing fast through firm, off-piste snow. So if you want a ski that’ll just absorb firm inconsistencies in the snow, I think there are several better (and mostly heavier) choices. But if you prefer to slow things down when the snow is really rough, the Commander 98 can still do that quite well. Since it’s so light and pretty easy to release from a turn, the Commander 98 can be fun to ski with a dynamic, “light on your feet” style. And that’s one of the things that sticks out to me with this ski. 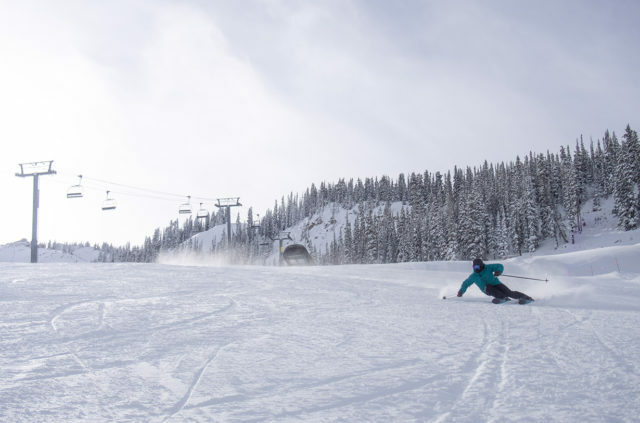 There are now a lot of very light, nimble skis out there, and there are also still some heavy skis that encourage skiing like a bulldozer with little regard for the conditions or terrain. But those light skis are often not very damp and / or strong, and the heavy skis don’t work very well when you want to make lots of quick transitions. 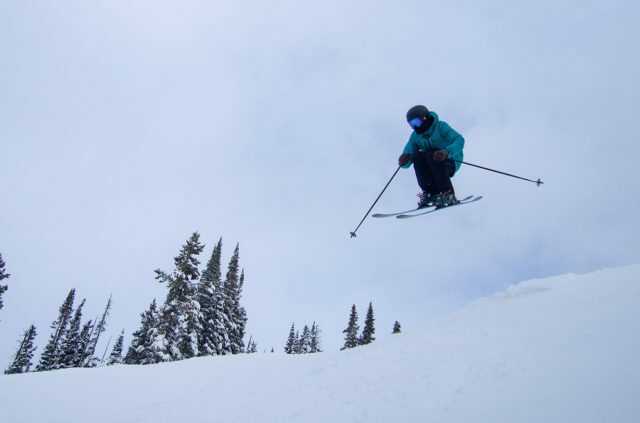 The Commander 98 sets itself apart because it is strong and damp enough to ski very hard and fast when conditions are pretty forgiving (i.e., at least a little bit soft and / or smooth). But it’s also very quick — I had no trouble making tons of small adjustments in bumps and off-piste snow on the Commander 98. I was on the 178 cm Commander 98 when they dropped the ropes on Resurrection under Crested Butte’s East River lift. The snow was untouched by skiers, though it had condensed to the point that the ~12” of untracked snow was pretty dense. In this snow, the 178 cm Commander 98’s tips did not rise very well, and I felt like I needed to ski backseat to prevent the ski from diving. Now, part of that is definitely due to the length — I typically opt for skis in the 183-190 cm range, especially in fresh snow. But I also think some of this could be attributed to the Commander 98’s tip rocker profile. Its tips don’t rise very high, and they did not plane up and over the snow, but instead cut through it. Granted, this is a 98mm-wide ski, so deep-snow performance probably won’t be a huge priority for many of you reading this. But if you want your ~98mm all-mountain ski to perform well in deep snow — and particularly at slower speeds — there are better options out there. This was one of the main questions I had coming into the review — would the Commander 98 be a good ski to use both inside and outside of the resort? Based on its performance and low weight, I think some people could definitely appreciate the Commander 98 as a 50/50 ski. It’s light, strong, and performs well in a pretty wide range of conditions. I think it could be a particularly fun ski for spring corn missions. That said, for where (Colorado) and how I ski (with a playful style), I’d want a 50/50 ski that’s a bit more forgiving and that will plane up better in deep snow. In the backcountry, it’s rare that I’m hitting high speeds, so I would prefer a ski that will forgive mistakes in tricky snow rather than have one that I can charge on. Since I can ski as hard and fast as I want in the resort, that’s where I prefer the Commander 98. Sam Shaheen on the Moment Commander 98, Crested Butte Mountain Resort, CO. So, whether or not the Commander 98 will work as a 50/50 ski comes down to your preferences. If you like a stiffer ski and are looking for a 50/50 ski that you’ll use in mostly shallow conditions, it could definitely work. I spent most of my time on the Commander 98 with the bindings mounted on the recommended line (-8.1 cm from center). I really liked it there — I could drive the front of the ski very hard, I could still ski it pretty neutral when I wanted to, and it felt pretty light in the air. I also skied the Commander 98 with the bindings at -6 cm from center. Here, the ski still felt “normal” and intuitive, just a bit lighter in the air. But since the ski felt so light on the recommended line, I ended up preferring it at -8 cm since I could get more leverage over the tips and really push the front of the ski when I needed to. When we first saw the Commander 98, we had a big debate about whether to go with the 178 cm model or the 188, and I figured I’d want to size up. The ski has lots of taper, deep rocker lines, and it’s quite light. But apart from deep snow, I’ve never felt like I needed a longer ski, and I doubt going up in length would’ve made a huge difference in deep snow. Plus, since I think the Commander 98’s quickness is one of its best traits, I think the shorter length plays well to that particular strength of the ski. 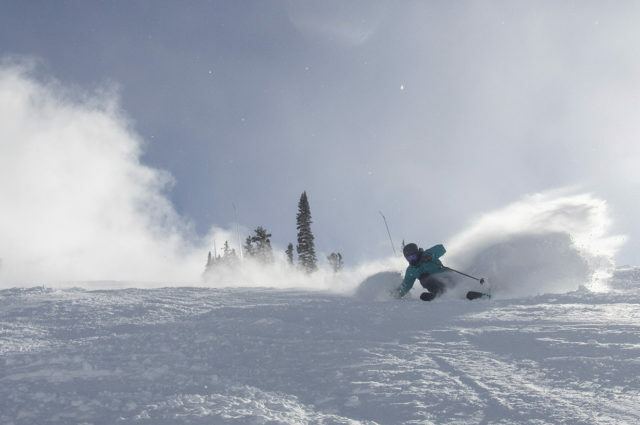 Advanced to expert skiers who like to ski hard and fast when conditions are soft and / or smooth, but who also like to ski with a dynamic style, make lots of quick adjustments, and find damp, heavy skis to feel sluggish. Moment’s Commander 98 offers an interesting combination of traits. 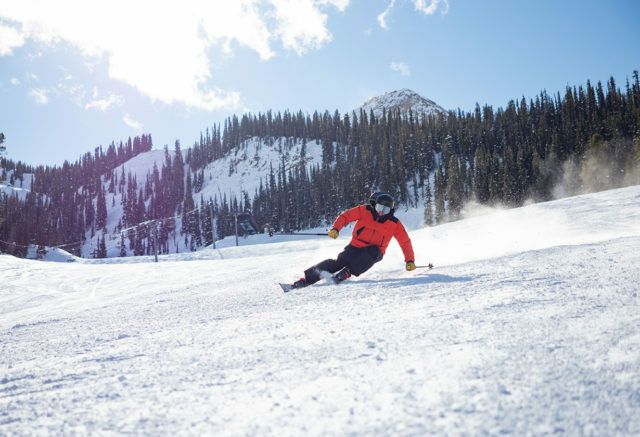 It’s very strong and can be skied very hard in fairly forgiving conditions, yet it’s also light, pretty easy to slide around, and rewards an active skiing style. Become a Blister Member or Deep Dive subscriber to check out our Deep Dive of the Commander 98 to see how it stacks up against the Blizzard Bonafide, J Skis Masterblaster, Volkl Mantra M5, Liberty Origin 96, Blizzard Rustler 9, Head Kore 99, Atomic Vantage 97 Ti, Renoun Endurance 98, 4FRNT MSP 99, ON3P Wrenegade 96, and more. Please compare this to the Masterblaster. Really, really want a deep dive of commander vs. Wren 96, Masterblaster and some 50-50 options depending on the conclusions of the initial review. Waiting for a review before I pull the trigger on these…..
Hi all, I’ve been eyeing the commander 98, masterblaster and ranger 102fr to replace my quiver of 1; 2015 atomic theory skis in 177 with Griffon 13s. I’m 47, 240lbs advanced/intermediate skier and usually ski in the chamonix valley where the conditions are mixed. I am not a park skier. Enjoyed the versatility of the atomics and i am generally happy with them, but i feel i need a next level ski with medium width on a damper and stabler platform at speed, that offers more confidence in steeper and harder conditions, with some soft snow access for the next 3 to 4 years. Hence the slightly stiffer candidates with metal. Likes of monster 98, experience 100, fx95hp, vantage97, mantra m5 and bonafide would probably be to much to handle. Enforcer and supernatural 100 probably aren’t going to help much on harder conditions. Ruled out the dynastar and black crows lines. Maybe I’m completely off the track here. Any direction, recommendations are welcome. Not sure how helpful this is, but the biggest difference I experience between masterblasters and kastles (I own both) is the tail. The masterblaster tail rocker makes them dramatically easier to slide around any tight spaces. They are also generally less beefy and therefore easier to pivot but this is more second order. You give up marginal edgehold on hard surfaces in exchange for above and if I were focused on high angle groomer carving I would likely prefer the kastles. In reality I care little about high angle carving and I am pretty bad at it. I do care a lot about off piste versatility (bumps, trees, chutes, weird snow) which they have in spades for a narrower ski. If I were to change one thing about masterblasters I would make them more directional and a bit more stable. My idea for how to that would be to keep the tail rocker but move away from a twin tip design and possibly bump up the stiffness. My impression is that ski doesn’t exist at the moment, but Commander 98s are on the short list of candidates. Let’s see what blister has to say though. Get the Masterblasters. I’m a huge Moment supporter and currently have the Commander 98 which I really enjoy (see my comments in the Flash Review), but I have to say the Masterblaster may be my favorite ~95mm ski of all time. I sold mine at the end of last season, but wish I hadn’t. While I like the Commanders, the MBs were just more fun, damp and just a better all-around ski. The Commanders are really not very good on ice or bombproof, but the MBs were as good as anything I’ve ever skied outside a true skinny or race ski. You will not regret scoring the MBs and you will have a smile on your face all day. Mark, thanks for the fx95hp comparison. I’m abit overwhelmed by this ski as it takes effort to bend and doesn’t really come alive unless pushed. There’s of course the non hp version, still I feel as I get older and less fit, i will need something slightly easier on the quads at the end of the day back down to the village. If the commander 98 is stiffer than the bonafide, then perhaps I should be down to ranger 102fr and masterblaster. Hope someone who has had experience with both these sticks, can catch this thread and comment. Sorry, I was not clearer on this point – I have not been on the FX 95 HP. I own and still occasionally ski the FX104 which is a predecessor model of the current BMX105 HP and that is what my comments were based on. My suspicion is that the essential point is not going to have changed very much. I could be wrong. also, further clarification, the masterblaster replaced a pair of Kastle MX 88s for me and the easier slide comment applies to those very strongly. Hi Blister. Love your reviews. Will there be a review on the ON3P Kartel 96 this year? How do these compare to the Armada ARV 96 Ti or Nordica Enforcer 104 free? Looking for a fun charger in the 95-105 mm waist range that is comfortable all over the mountain, in the air, and carving. I’m also a bigger stronger guy and don’t want to overload the skis. Could these be a good fit?